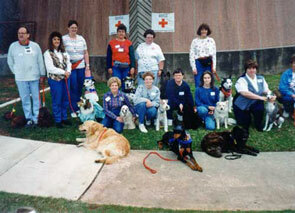 Approximately 20 Therapy Dogs International volunteers and their dogs responded after the bombing of the Murrah Federal building in Oklahoma City in 1995. This was our first experience in working with people affected by a terrorist attack. The emotional impact of the attack affected most people in the United States. 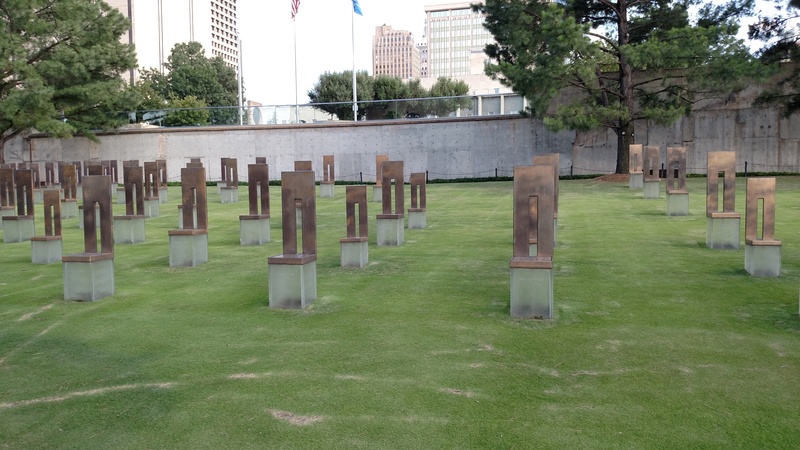 To remember the victims and the helpers at the Oklahoma City bombing, we created a special newsletter in the fall of 1995 Heartache in the Heartland. Here is a quote from this newsletter, a quote that can be applied to any disaster where we have responded. 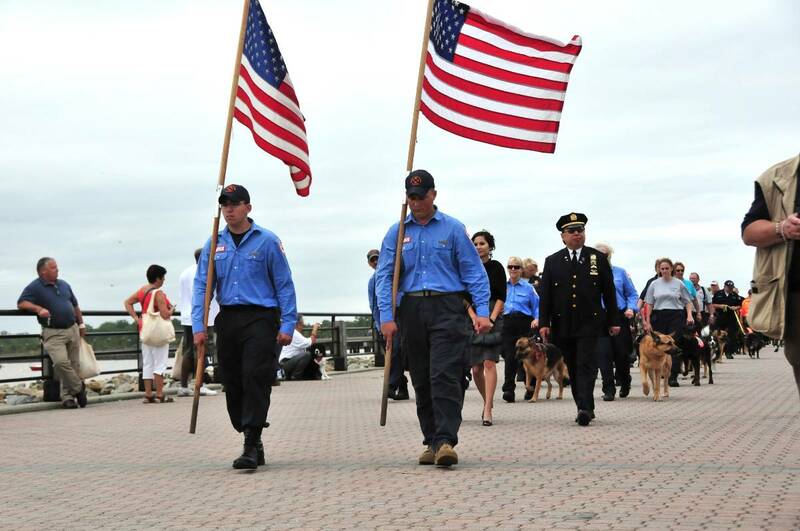 "...Dogs were hugged and petted by the families of the victims, displaced persons, members of the Red Cross and the Salvation Army, clergy, police officers, firefighters, U.S. Army Reserve troops and other relief workers." 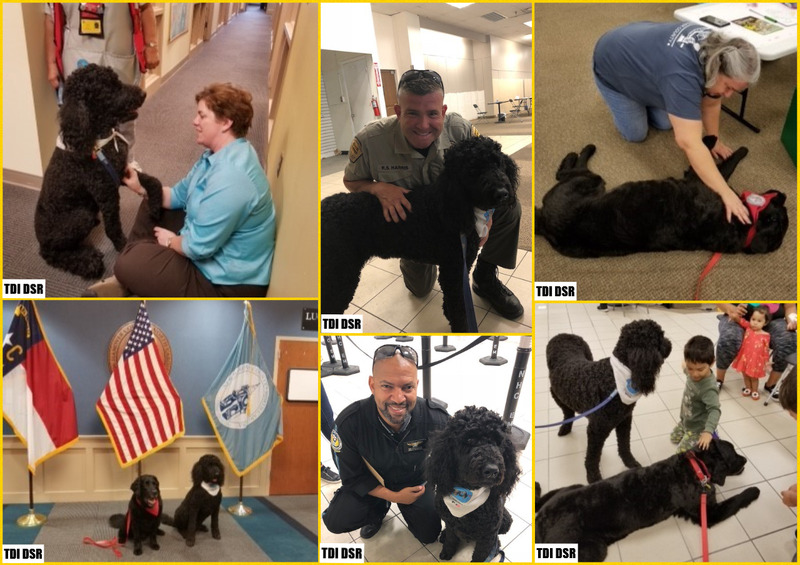 After the experience gained in Oklahoma City we realized how important the use of Therapy Dogs are in working with people affected by a disaster. 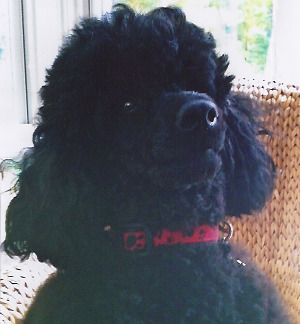 "Wusel" is owned by Ursula A. Kempe, President of TDI. are the hours you help us see the light through the pouring rain. the joy and inspiration that’s sometimes hard to find. You stand by like an anchor, tail wagging in the air. solace in each stroke, you prevent our falling apart. you swallow them back, hold your post and calm so many fears. You let us touch and talk to you as we try to fill the holes. and there you are with pricked up ears and then we’re not alone. "Here’s my tummy - you can have it…just give me a snack." you specialize in soul speak that never ceases to delve. You let us cry and let us laugh and get all of it out. you saved me every single day, I survived because of you. 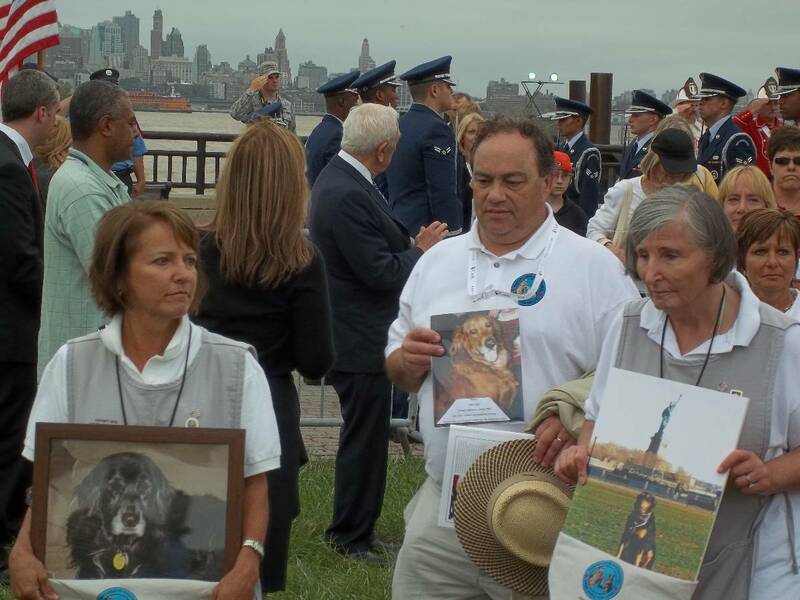 "Dedicated to the therapy dogs at Pier 94 in NYC who work so hard responding to the human mess of 9/11, particularly to my special friend, Wusel*. Thank you, dogs and humans for your undying love." Thank you Sarah, we love your beautiful poem, it was shared and read by our volunteers. Thank you for your work at Pier 94. The taking of photographs at the FACs was not permitted out of respect for the grieving families. The generosity of Americans is known throughout the world. 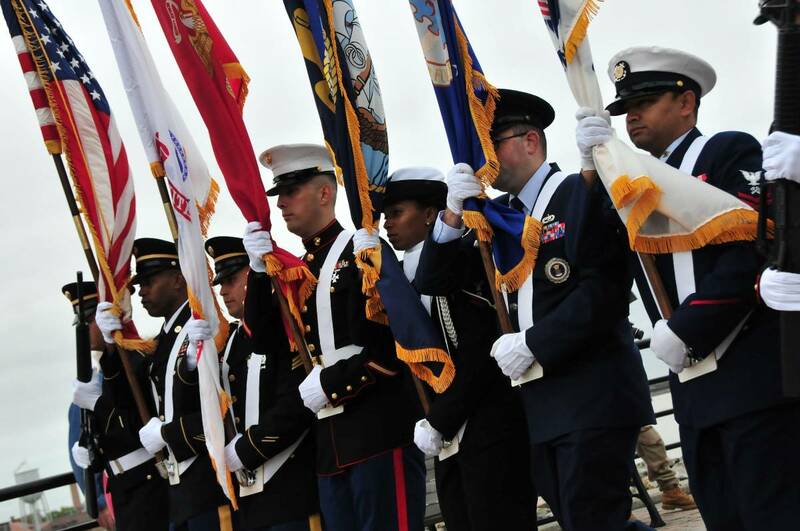 The tradition of volunteering is one of the finest examples of the American spirit of giving. This volunteer spirit is clearly evident in times of disaster, as Americans from all walks of life and all parts of the country come together to help their neighbors in distress. 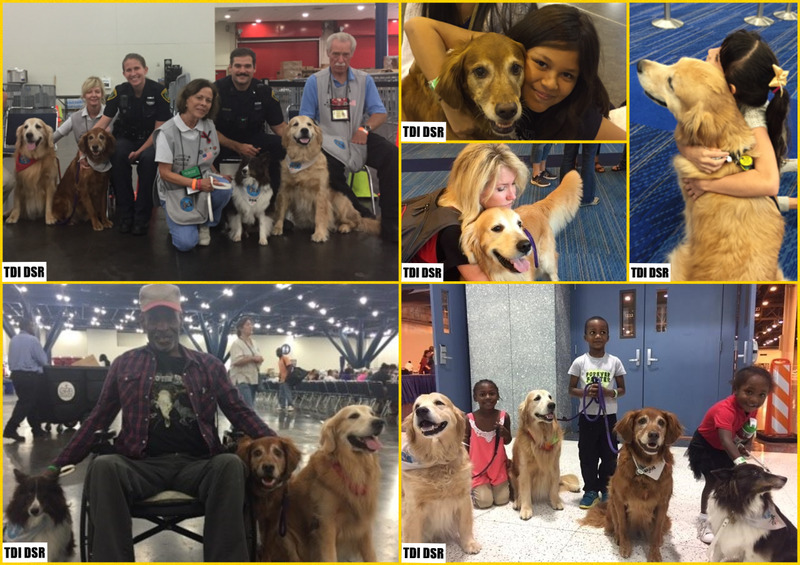 The Therapy Dogs International (TDI®) volunteer members exemplify the mission of TDI, to bring comfort and consolation to everyone and anyone, wherever it is needed. 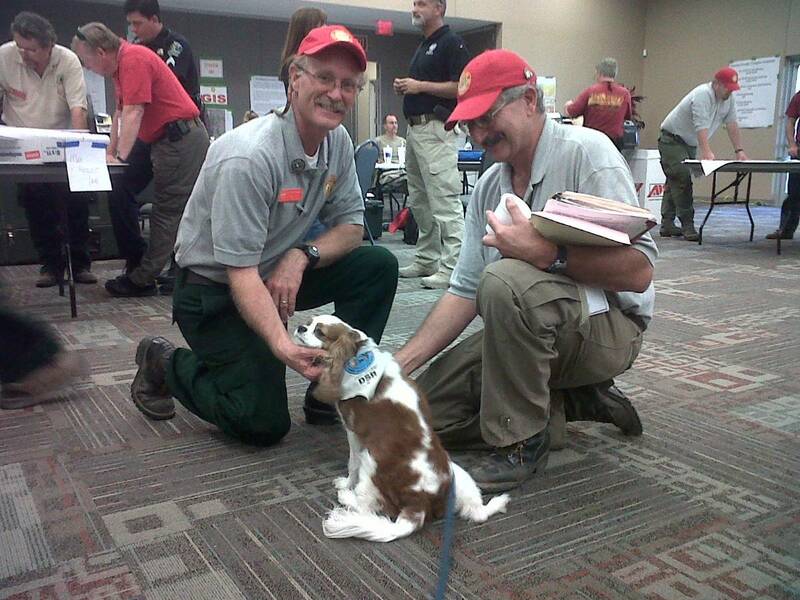 TDI DSR (Disaster Stress Relief) volunteers now courageously join disaster relief efforts all across the country. 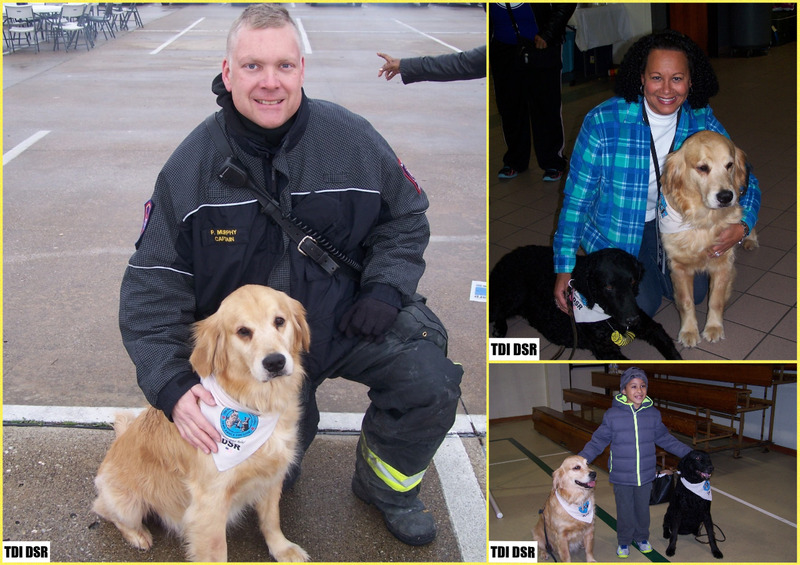 TDI members and their Therapy Dogs responded to the call for help from Oklahoma City in the aftermath of the destruction of the Alfred P. Murrah Federal Building. After September 11, 2001 (9/11), people who lost loved ones in the destruction of the World Trade Center (afterwards known as ground Zero) and a section of the Pentagon, as well as people who suffered injuries and loss of property, were directed to "Family Assistance Centers" (FACs). 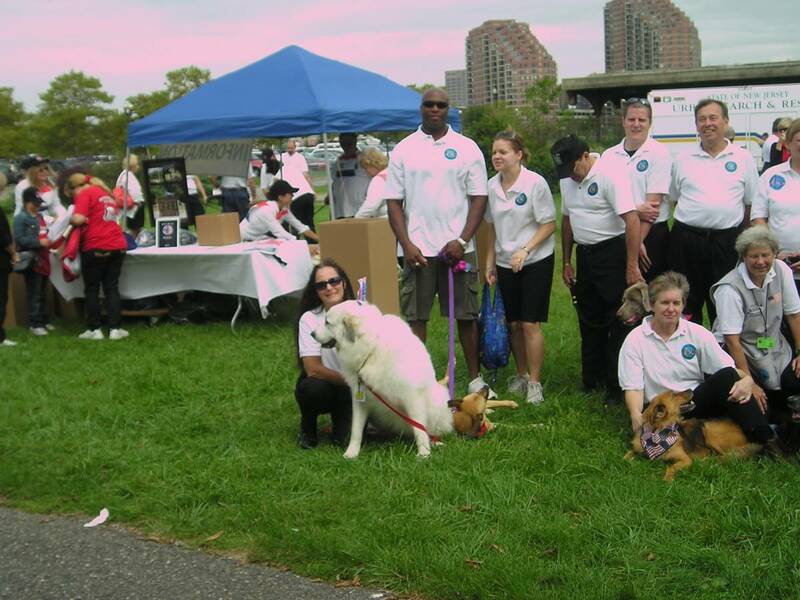 TDI members and their Therapy Dogs volunteered at FACs in New York City, New York, Liberty State Park in Jersey City, New Jersey, and in Washington, D.C.
…Dogs were hugged and petted by the families of the victims, displaced persons, members of the Red Cross and the Salvation Army, clergy, police officers, firefighters, U.S. Army Reserve troops and other relief workers. This quote was taken from our special edition newsletter of Fall 1995, Heartache in the Heartland. The words sounded all too familiar to volunteers working at the various disaster sites after September 11th. 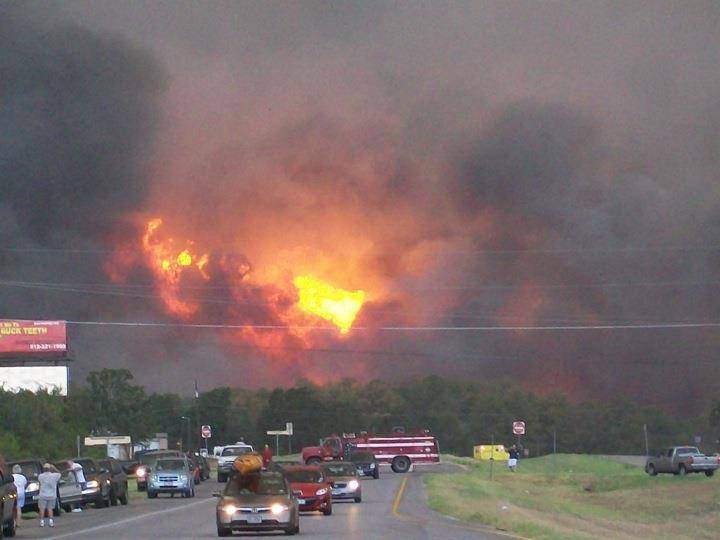 From the experiences of TDI members at these disasters, the TDI DSR program was created. 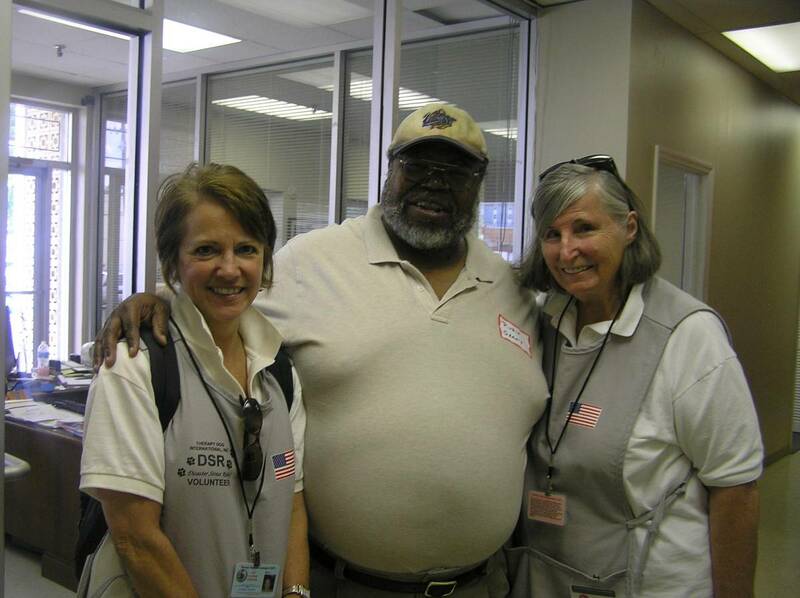 TDI DSR members volunteered their services in Baton Rouge, Louisiana to provide stress relief for refugees as well as the rescue workers coming to and from New Orleans in the aftermath of Hurricane Katrina. TDI volunteers are the key that unlocks the door through which professionals can enter the world of people affected by disasters. 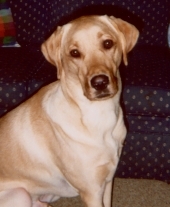 Because people are drawn to dogs, people will talk to a TDI handler, or, often, a Therapy Dog, when they are still in shock; when they are unable to process the necessary information available from professional assistance. TDI handlers perform a necessary triage service by assessing the needs of an individual and discreetly beckoning the appropriate health care worker to come to the aid of the individual, thus getting the right help to the right person at the right time. 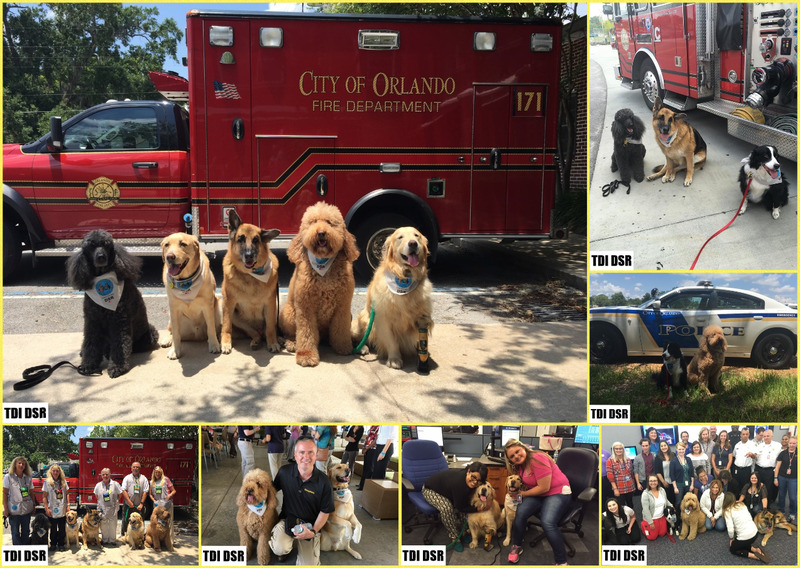 The TDI Therapy Dogs also provide hugging time for the professionals (including police officers, firefighters, medical professionals and other relief workers and volunteers, as well as members of the clergy), who suffer their own emotional pain when dealing with the devastating pain of others. 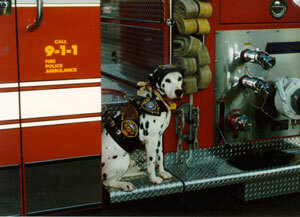 In this section of our Web site, TDI pays tribute to all our 9/11 human and canine volunteers. 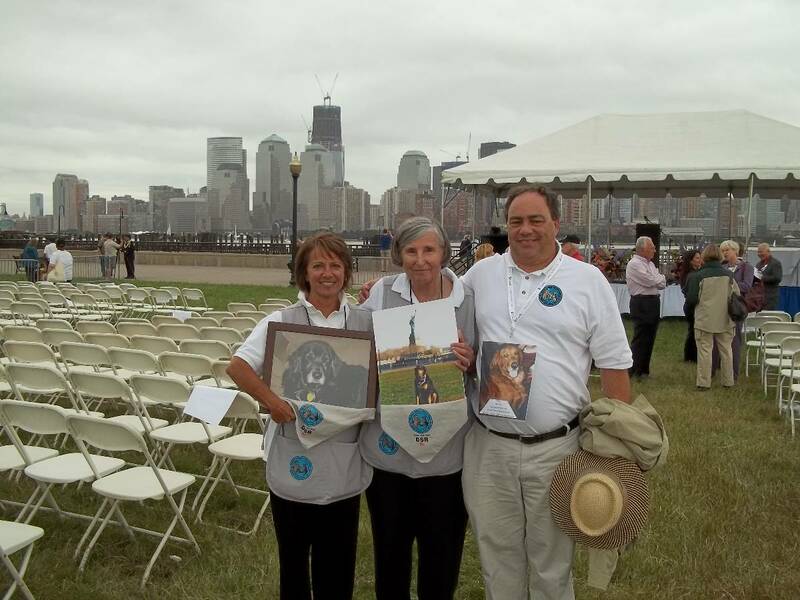 At the FACs set up at Pier 94 in New York City, Liberty State Park, and near the Pentagon, more than 150 TDI members and Therapy Dog teams attended to the emotional needs of displaced persons, family members and relief workers. 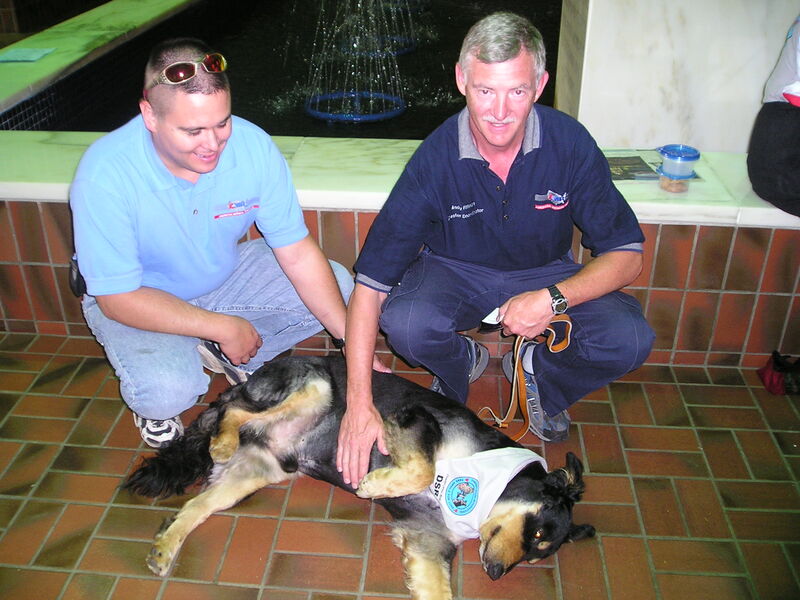 The TDI Therapy Dogs who participated in the 9/11 relief efforts gave everyone unconditional love, a feat unmatched by fellow humans. 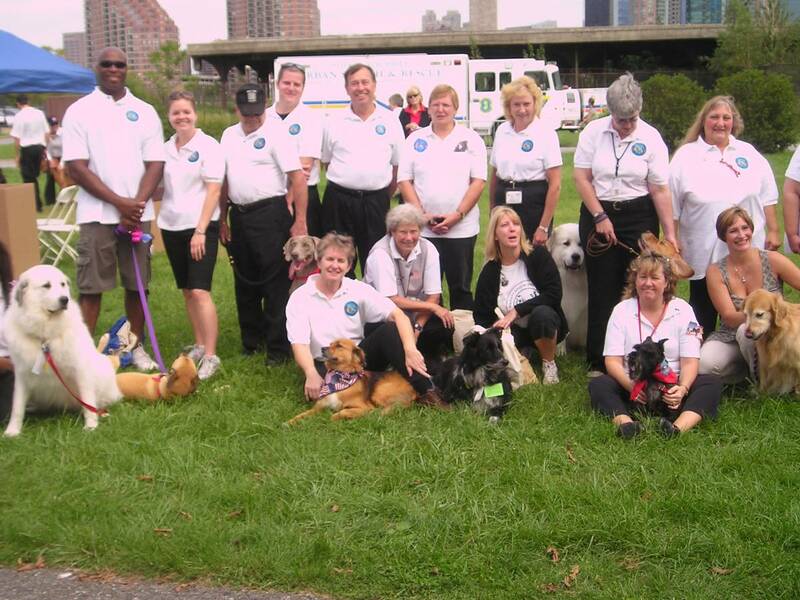 The TDI volunteers and their Therapy Dogs covered various shifts for a period of three months at the FAC at Pier 94 in New York City, until the closing in December. 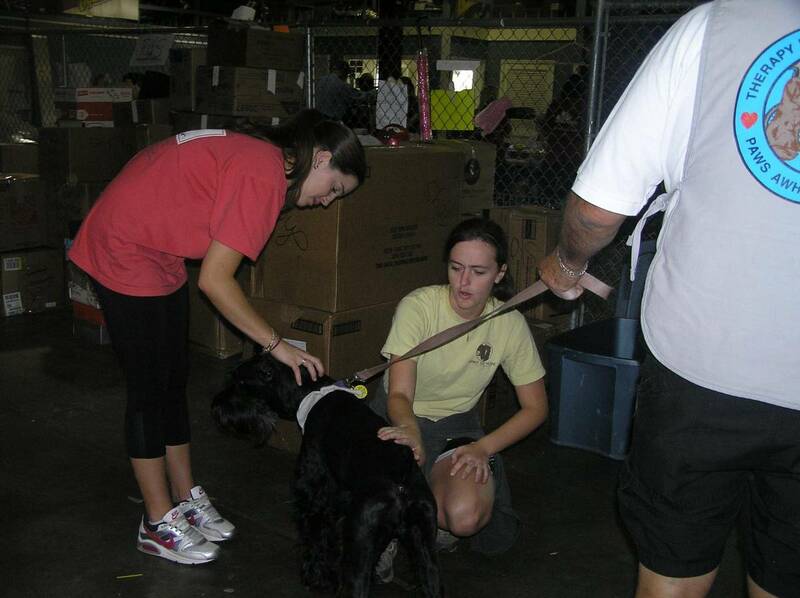 In Washington, D. C., TDI members volunteered for one month at the Pentagon FAC. 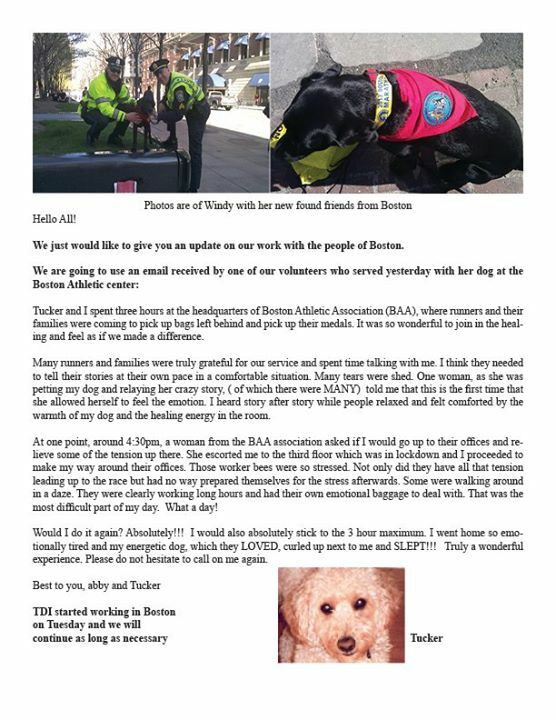 The TDI handlers received no monetary compensation for their extraordinary efforts in both New York and Washington, D. C., but earned the immeasurable reward of knowing they provided solace and a respite from the unrelenting chaos that a disaster leaves in its wake. 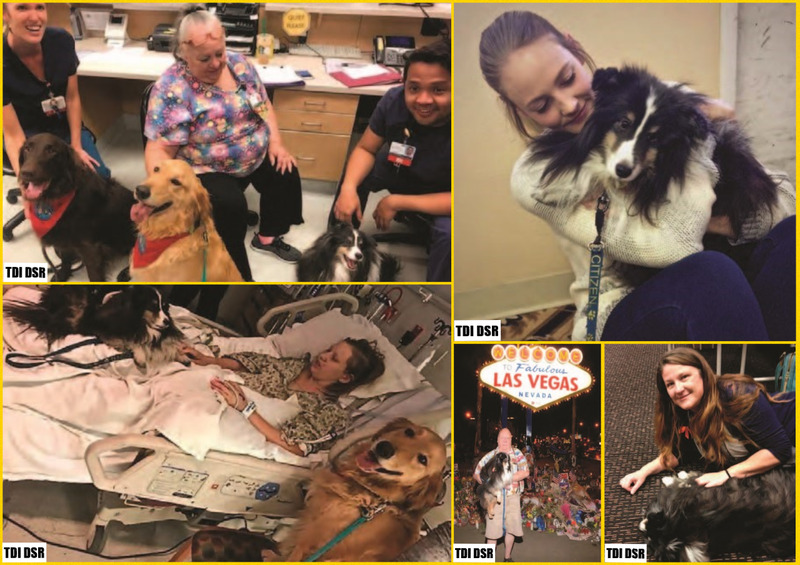 TDI Therapy Dogs and their handlers cannot heal someone's wounds, but they can make a difference in the emotional life and reclamation of a strong self, necessary for the ultimate cure of a victim of disaster. 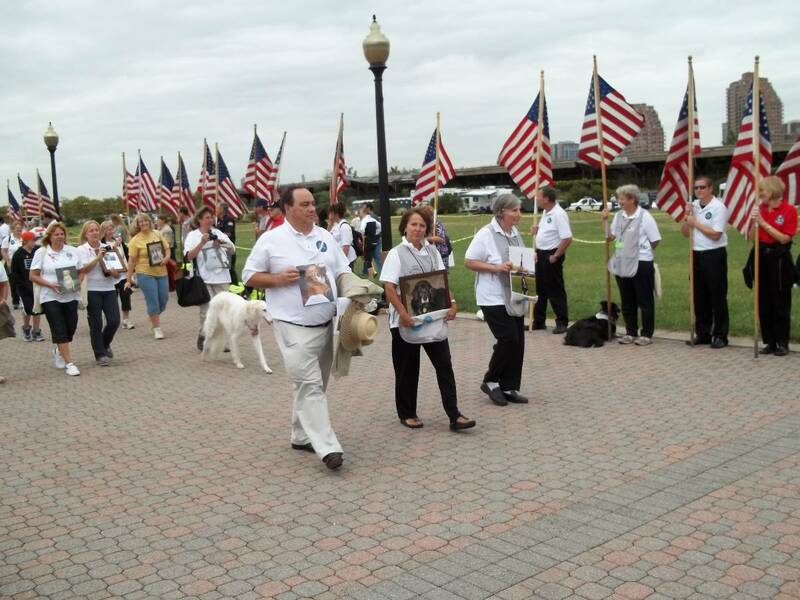 Therapy Dogs International, Inc. salutes the steadfastness and commitment of our volunteer members and their loyal Therapy Dogs for their dedication and resolve during the national crisis of September 11, 2001. 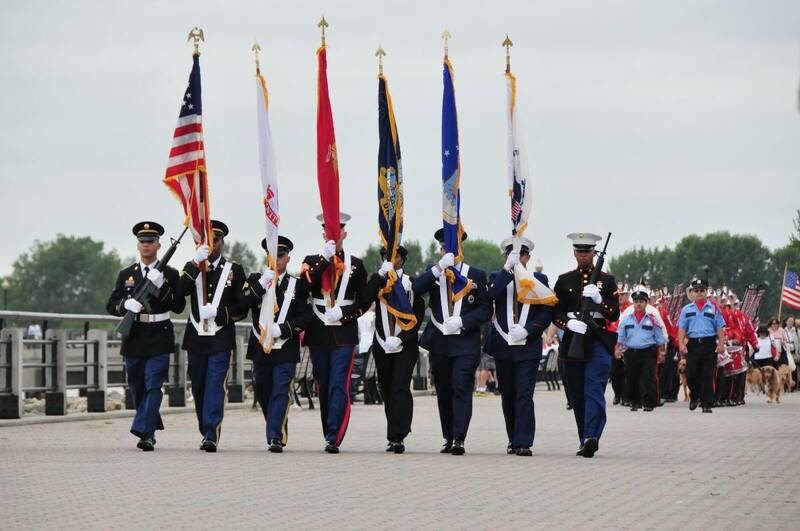 None of us imagined it would come on September 11th--we were a mere month into our program and fresh out of training. But there we were, suddenly smack in the middle of a national crisis that even our leaders had no precedent for. We joined our country in stepping forward into the unknown, scared but willing. On October 1, 2001, I got my deployment orders. At all of 23 years of age, they assigned me to Pier 94 as a caseworker for those who had lost their livelihood. My responsibility for six weeks was to meet with individuals--usually twice my age or more--to listen to their stories, assess their loss, and provide assistance. The clients I met with had managed to escape with their lives, but they had little else. My clients were mostly members of the peripheral industries that supported--and relied on--the business of the World Trade Center. My clients were the drivers, the dry cleaners, and the food vendors that served a now demolished cornerstone of the American economy. They weren’t the ones in the headlines. They weren’t the ones in the news. They grieved in private, not even a blip on the media radar. These clients had often spent their lifetimes building their own businesses from nothing, and now they had--once again--nothing. 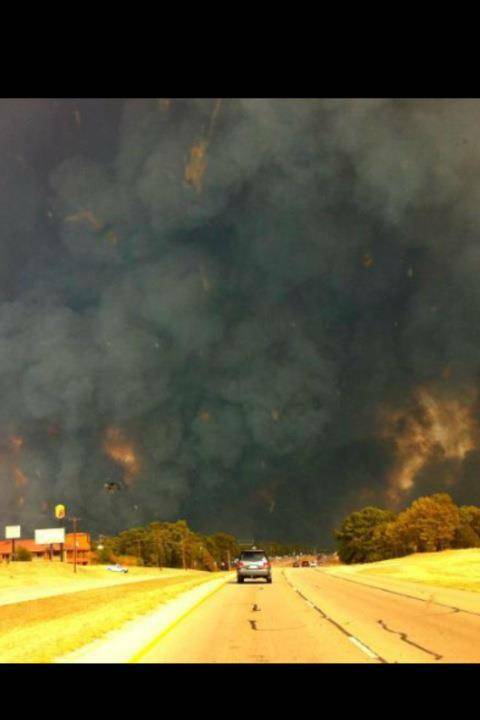 I watched as grown men cried, wondering how they would take care of their families. And then I’d watch the shame about their grief creep in, as they considered the many others who had lost so much more. I’d assure them that their pain and loss was just as real. No matter what was going on with anyone else, it was okay that they were sad and scared, too. I tried to hold it together as adults fell to pieces in front of me. And as they’d try to sort through their emotions, I used pre-determined formulas to calculate exactly what their loss equaled in financial aid. No matter how much I was able to push through the system…no matter how often I was able to justify giving the maximum assistance allowed…it was always completely inadequate. I was completely inadequate--or at least, I felt like it. I mean, there I’d sit with a 64-year old man whose clients were now dead and whose regular route was now covered under 5 feet of debris and horror and the best I could do was offer him a $1500 voucher? But the clients never asked for more. They always appreciated whatever they received. However, no matter how grateful my clients were, I ended each session with deep sorrow, guilt, and anger at not being able to provide more, but there was no time for me to dwell on that. My job was to be strong for them. To help them. To instill hope. It was not about how sad I was that I couldn’t do more in the wake of such tremendous tragedy. So, I’d just sit there and shove it down and try not to think about it. I’d make it through my twelve-hour shift, go back to my hotel room and just sit there in numbness. Then I’d try to sleep but would be unable to, and it would start all over again the next day. I didn’t talk to anyone about this--after all, I had lost nothing. Much like my clients often felt about themselves, I was not a victim. I wasn’t even volunteering on the front lines or doing search and rescue. I had it good. I had no right to be sad. I had no right to cry and therefore, would not. Until I saw the dogs. I can’t remember the first time I saw one, but I remember the feeling--like being picked up and held close. It was like being recognized and then embraced by an old friend. They had sniffed out my broken spirit and were licking the wounds on my confused, scared, and sad heart that I didn’t believe I deserved to have. But they knew better. Over the days and weeks, I came to have my favorites (Wusel was my best bud), and eventually, I started taking breaks so I could specifically go in search of him. Up to that point, taking breaks had been difficult for me to do. The line of people waiting to receive assistance was hours long, and I never could justify leaving my station, even for a minute, when there were so many clients waiting. The dogs gave me a reason to get up, and when I did, they found my pain and held it for me. I shed my first tears on Wusel’s furry neck. And after I did, I felt the weight in my chest start to lift. So I visited again the next day. And the next. The dogs sat with my grief so I could sit with my clients’. The dogs validated my pain and in turn, I validated my clients’. 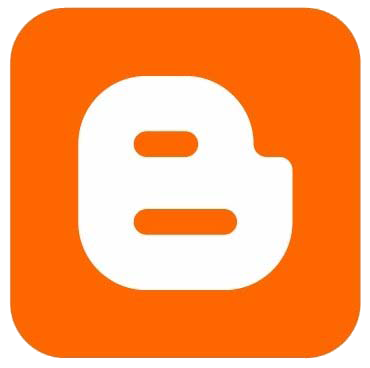 Without the work Wusel did for me, I couldn’t have done the work for my clients. 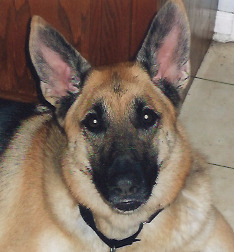 So now it’s ten years later, and Wusel (and many of the 9/11 TDI dogs) has since passed, but his legacy remains. I wasn’t a victim. I never even saw Ground Zero. But Wusel recognized and embraced my pain all the same. And he healed me. And because he healed me, I was able to help heal others. 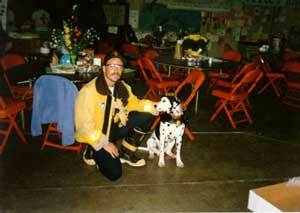 Many of the dogs are no longer with us, also some of the handlers. 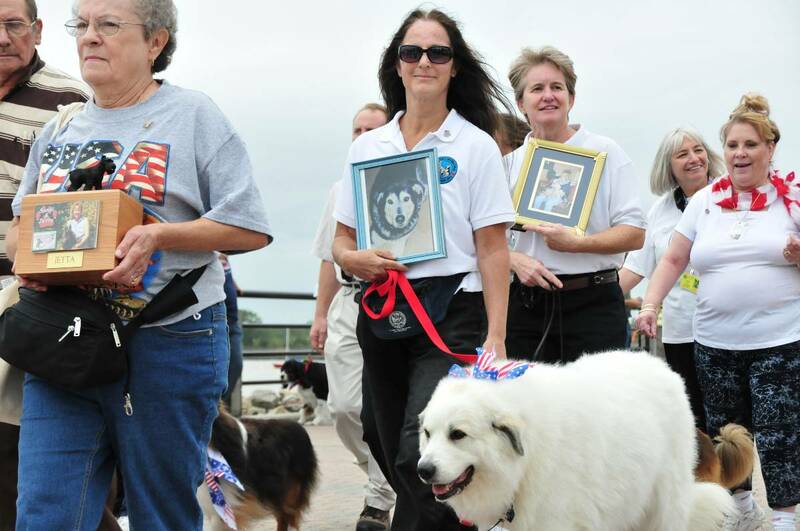 Some of the dog handler teams pictured here carried photos of their dogs who have now gone over the "Rainbow Bridge". "One particular person that we saw every day in one of the centers we visited was a beautiful eighty-seven year old lady. She had the spirit and movement of a thirty year old. 'I see God in the eyes of this dog,' were the comments to each of us. 'The world needs ninety-nine Therapy Dogs and one human.'" 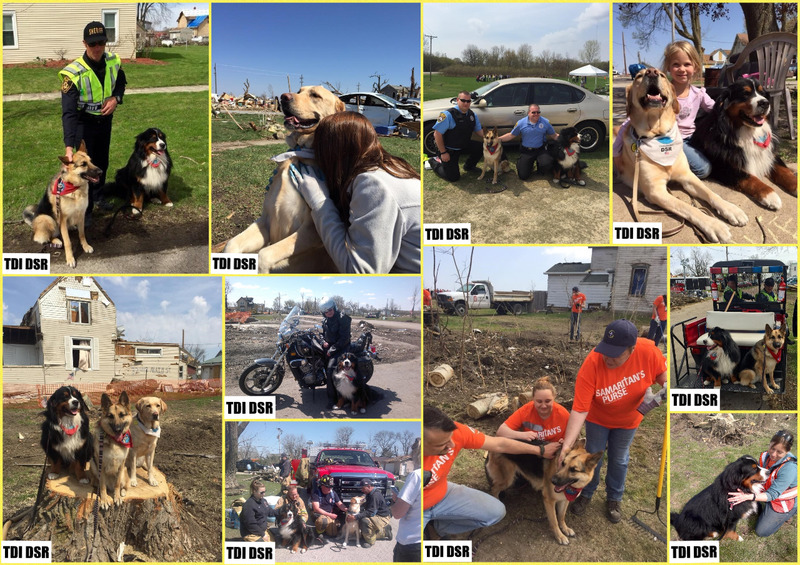 After tornadoes devastated the town of Tuscaloosa, Alabama, the TDI’s Disaster Stress Relief Dog teams traveled to the disaster site. Teams from New York and New Jersey drove down to Alabama by van and met up with teams from Florida, Georgia, South Carolina and North Carolina. The teams were stationed outside of Tuscaloosa at the Rolling Hills Camp Grounds in Calera. Each day they would travel to relief sites set up by volunteers and relief organizations both local and national. 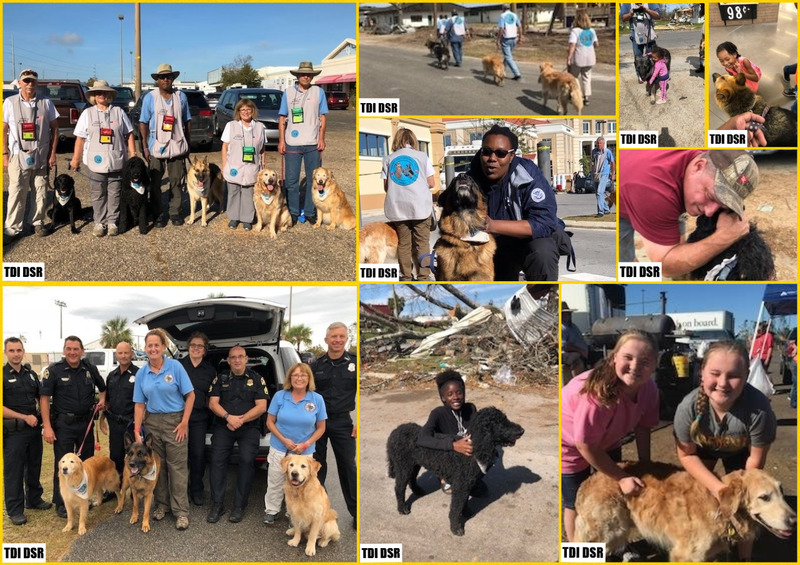 The victims and helpers appreciated the Disaster Stress Relief Dogs and the brief respite that the dogs and handlers provided from the surrounding chaos. Sometimes people need affection and comfort. Who better to fulfill those needs than man’s best friend? 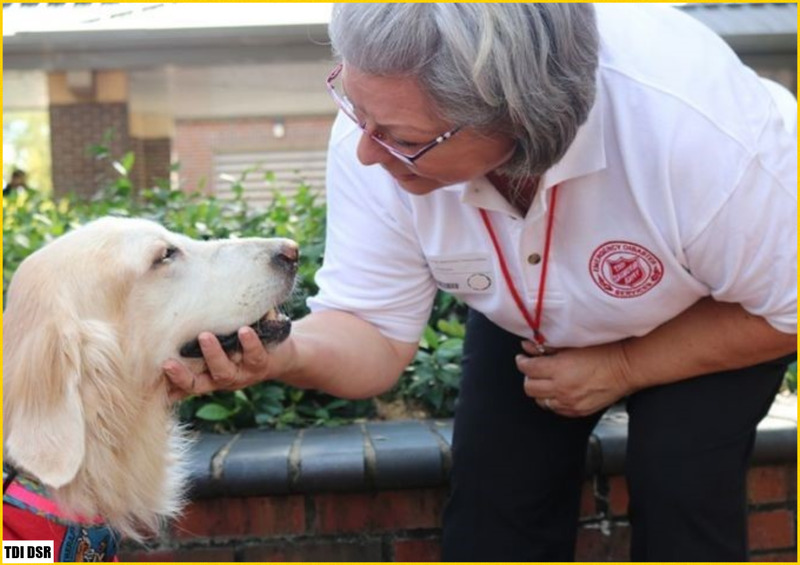 The Disaster Stress Relief Dogs program strongly believes in Therapy Dogs International’s slogan “A Dog Will Love You Forever.” This idea is reflected in their relief efforts and is the reason for their success. While in Tuscaloosa, Alabama, TDI was interviewed by Unleash Magazine. 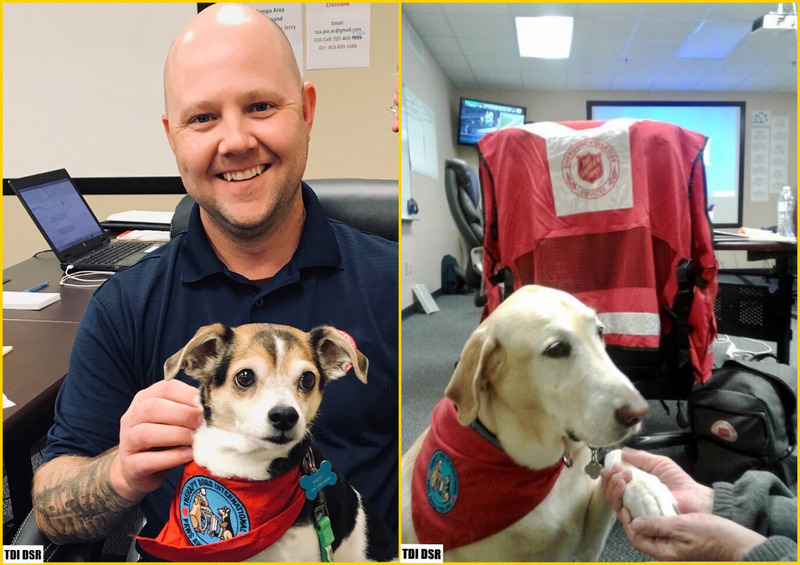 This interview gives an inside look at the background and development of the Diaster Stress Relief Dog program and their relief efforts in Tuscaloosa. Please click here for Unleash Magazine Interview. 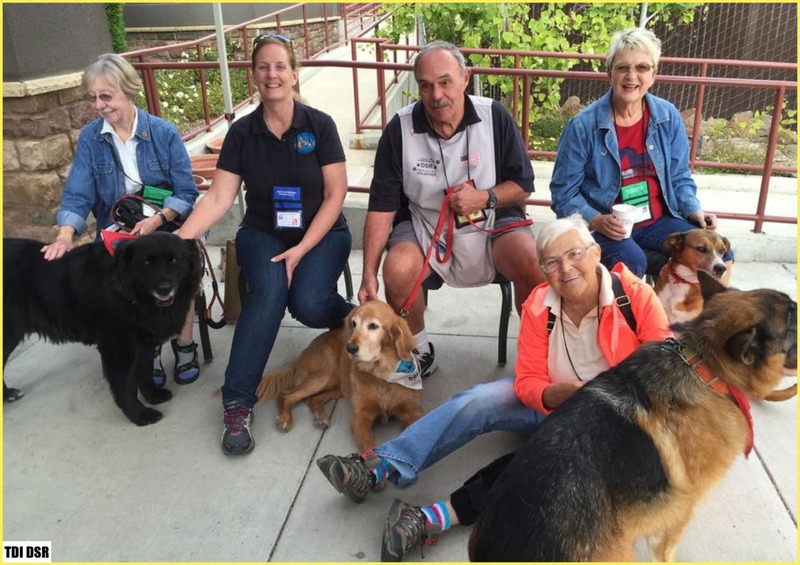 With canines on leashes, a group from Therapy Dogs International arrived at Christian Service Mission in Birmingham last week, seeking information about where they could be of service. 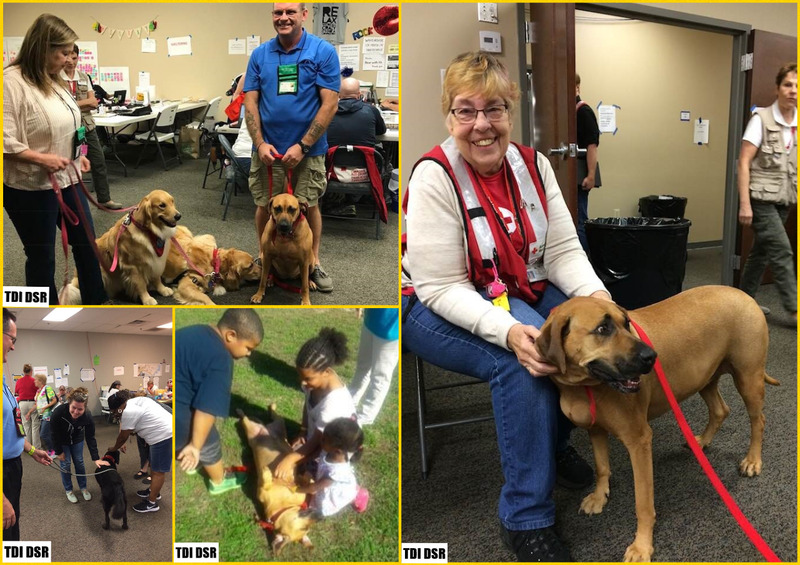 The group had been in Tuscaloosa for a week-and-a-half, providing their own unique style of relief with their Disaster Stress Relief dogs for victims of the April 27 tornadoes. Someone from Unleash Magazine suggested they come to Birmingham to visit with more tornado victims. Unfortunately, the group never made it back to Birmingham. One of the dogs was injured doing tricks and the husband of one of the handlers was having surgery. 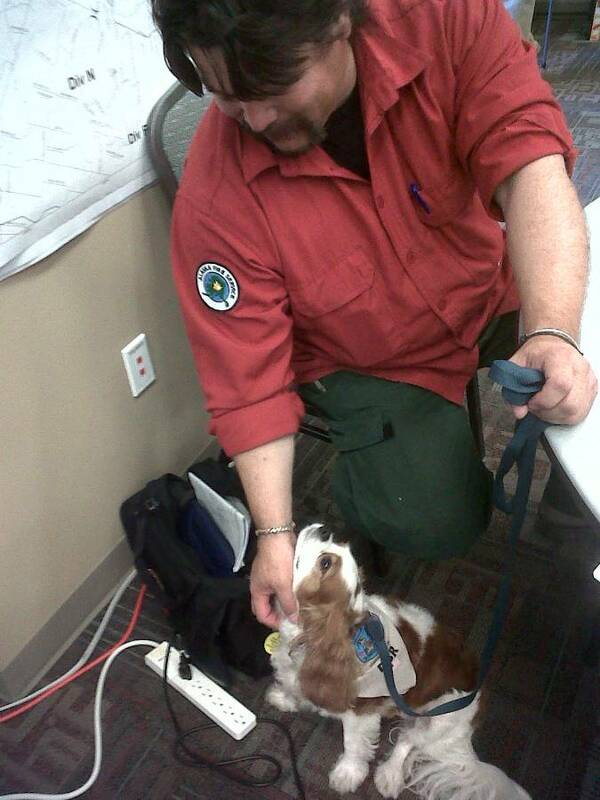 Plus, some of their Disaster Stress Relief team members had jobs they needed to return to. Kempe did fly back to Birmingham on Tuesday to pick up a motor home they had purchased and was going to drive it back to Flanders, N.J., TDI headquarters. They were not bringing another group down. The acquisition of the motor home was made primarily so the dogs can have a respite from the heat when they visit disaster areas, because the dogs can be out in the heat for only an hour or so before they need to cool off and rest. 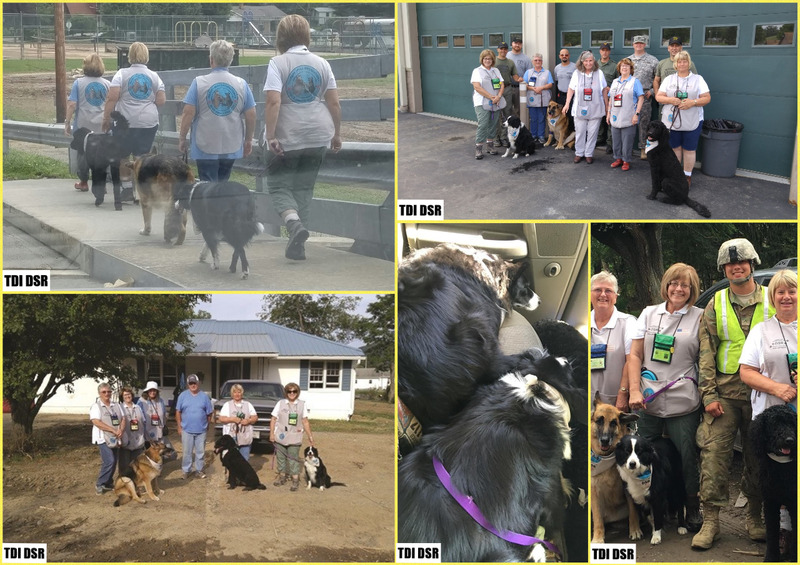 The TDI Disaster Stress Relief Dog group that visited Tuscaloosa included members from New Jersey, New York, Florida, Georgia, North Carolina and South Carolina. 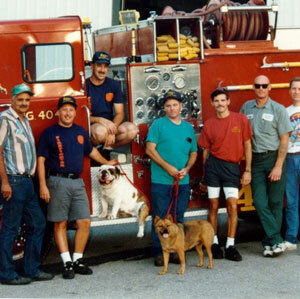 TDI was formed in 1976 in New Jersey with five handlers and six dogs, but quickly discovered a need for expansion. The organization has several programs, such as hospitals, nursing homes, shelters, schools and libraries. It’s been proven clinically that through petting, touching and talking to animals, people’s blood pressure is lowered, stress is relieved and depression eased. 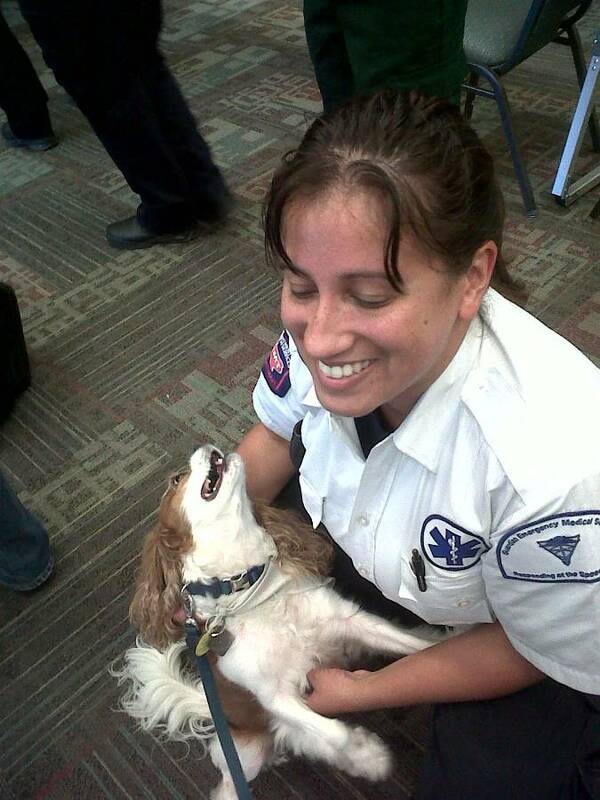 Therapy dogs also provide hugging time for the professionals (including police officers, firefighters, medical professionals and other relief workers and volunteers, as well as members of the clergy), who suffer their own emotional pain when dealing with the devastating pain of others. 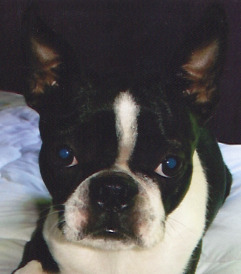 The non-profit organization registers all breeds of dogs. Some dogs have pedigrees, while others have been adopted from local shelters or are rescue dogs. 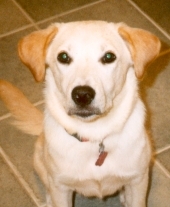 To belong to TDI all dogs must be tested and evaluated by a certified TDI evaluator. 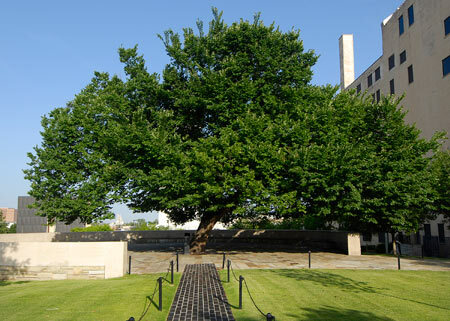 The Disaster Stress Relief program started following the Oklahoma City bombings in 1995. 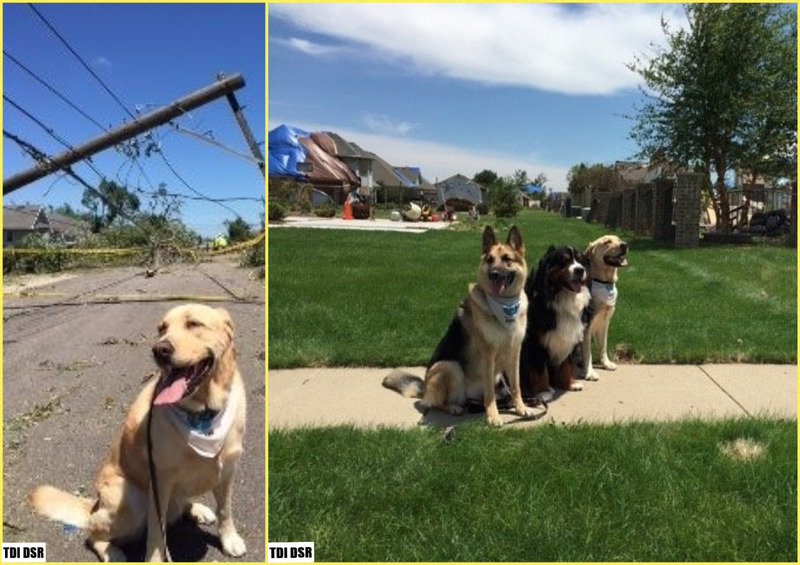 “After the experience gained in Oklahoma City, we realized how important the use of therapy dogs is in working with people affected by a disaster,” Kempe said. TDI also worked with those affected by 9/11 terrorist attacks in New York/New Jersey and Washington, D.C. and with victims of Hurricane Katrina. The 9/11 encounters turned into a learning experience. 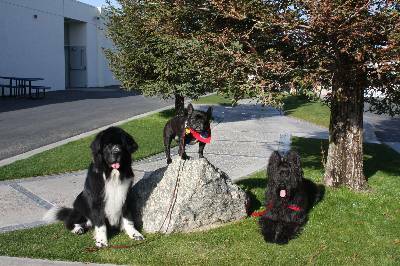 To belong to TDI, all dogs must be tested and evaluated by a certified TDI Evaluator. 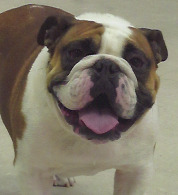 A dog must be a minimum of one year of age and have a sound temperament. 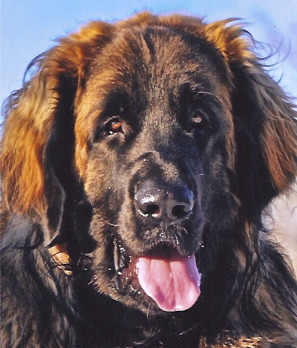 Each dog must pass a temperament evaluation for suitability to become a therapy dog, which includes the American Kennel Club’s Canine Good Citizen Test. The test also includes the evaluation of the dog’s behavior around people with the use of some type of service equipment (wheelchairs, crutches, etc.). Nanette Winter, a psychological therapist from northern New York state, has been a member of TDI since 1993. 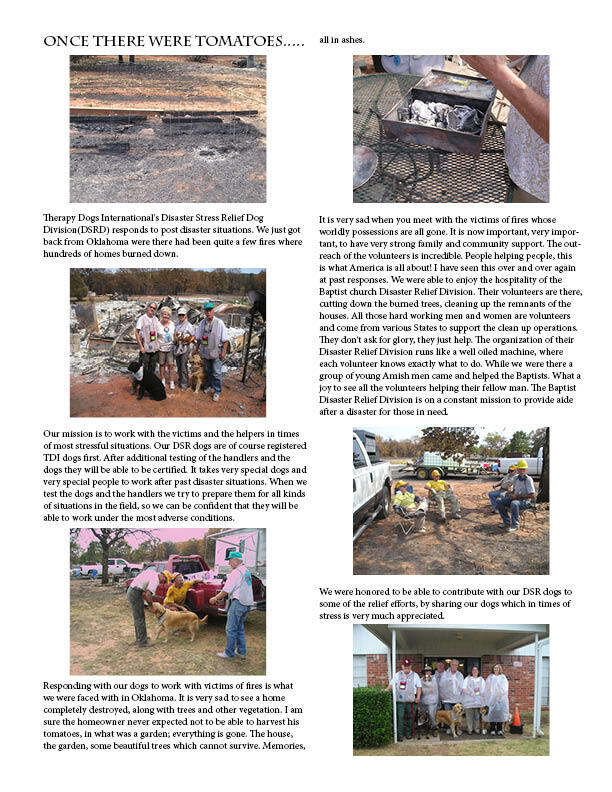 One of TDI’s Disaster Stress Relief Dog teams responded in the aftermath of the devastating fires which burned more than a thousand homes in the Bastrop area. 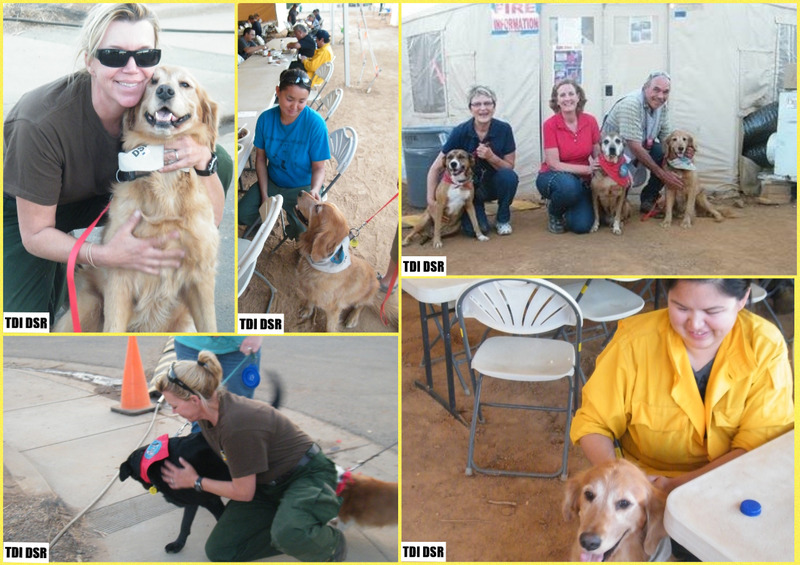 The TDI DSRD team volunteered with six special trained dogs. 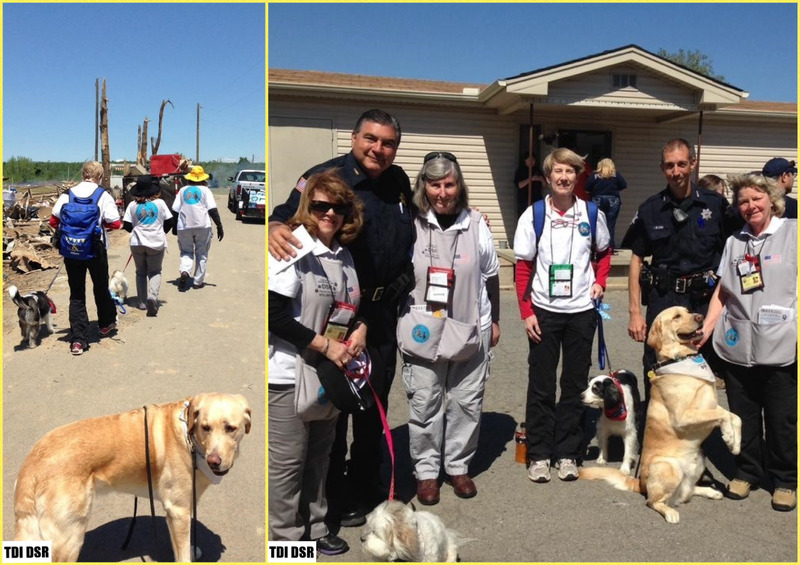 These dogs and their handlers work with people who have been affected by a disaster. 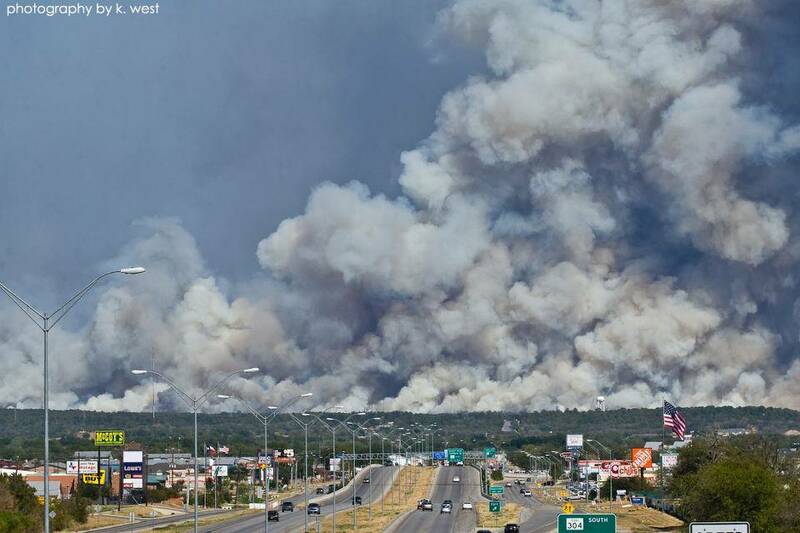 This includes not only the people who have been directly affected but also all the relief teams, from the Incident Commander and his teams, to the fire fighters and other personnel. Petting a dog can really help in times of extreme stress. 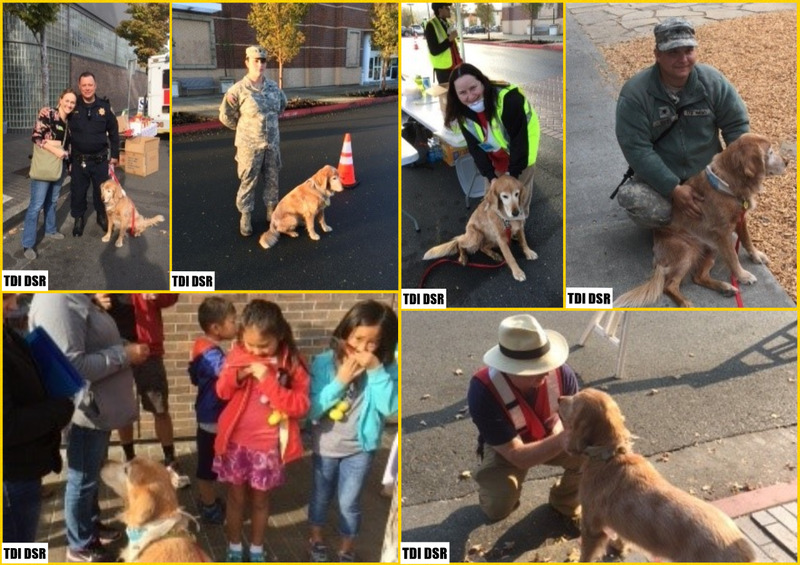 Bringing comfort and stress relief is the special mission of our DSR dogs. Thank you to Karen Haney for doing a terrific job in scheduling all the volunteers. To Lauren Friedman for re-evaluating all the dogs, to Denise Marcella for evaluating the handlers and to Kathryn Zaharek for her public relations efforts with the Town of Newtown. 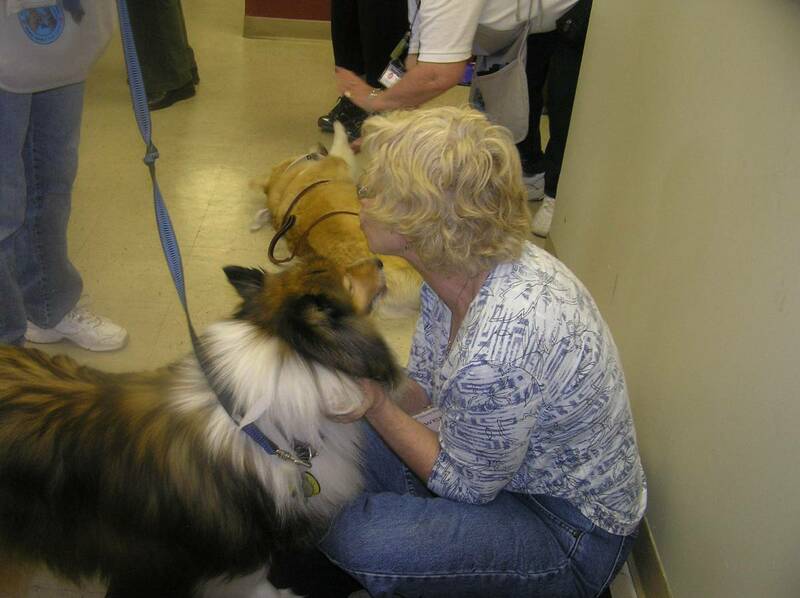 Thank you to all of our volunteers with their wonderful Therapy Dogs!!!! 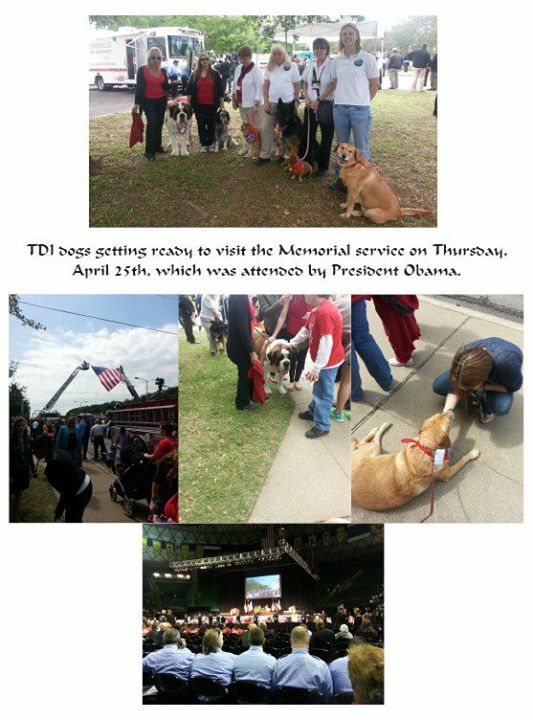 TDI was represented at a THANK YOU ceremony in Newtown with some of the therapy dog teams who have been working in the various schools in Newtown, CT after the horrible shooting incident from December 14, 2012. 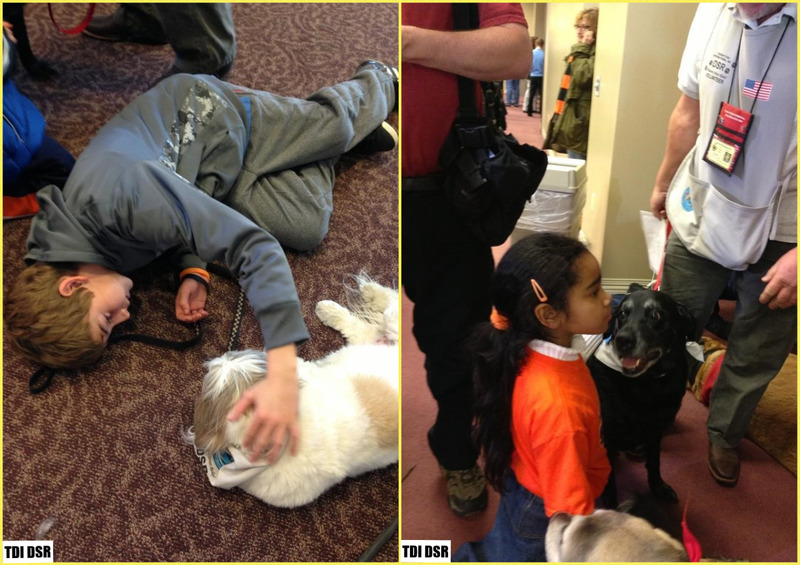 Following the tragic events at Sandy Hook Elementary School on Dec. 14, 2012, Therapy Dogs International immediately responded by sending teams of dogs and handlers trained in disaster stress relief into the Newtown, Conn., school district. On Jan. 10, less than one month after the Sandy Hook incident, police reported a Taft Union High School student carrying a shotgun entered a classroom and critically injured one student and grazed a teacher, which prompted TDI President Ursula Kempe to contact me because I am the only certified Disaster Stress Relief Dog handler in Kern County. I was instructed to locate, evaluate and select therapy dog teams that could be sent into the school and stand by until contacted. I spoke with Marilyn Brown, the principal of Taft Union High School, on the Saturday following the shooting and we decided to bring some of the dogs in on Monday, brief the teachers and staff on what we would do and determine the best places to use the teams when the students returned to school on Tuesday. From the moment the dogs set paws on campus, they exceeded everyone's expectations of the impact they would have. Their innate ability to know just what to do and when, was, and continues to be, uncanny, whether clownishly performing a trick to elicit a laugh, demonstrating their proficiency on commands or patiently submitting to hugs for the gazillionth cell phone picture. 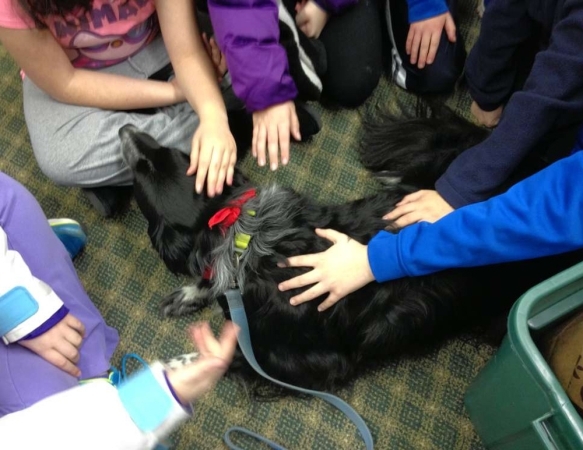 And there are no words to describe the emotion you feel when you see a dog stoically press his own body up against a student or teacher's body and lay his head on their shoulder as if to say, "It's OK now, I'm here for you." These dogs do it all. But this work does take its toll on the dogs. Because of their sensitivity to those whose sorrow and fear they seem to absorb, we have to be careful to monitor their stress and fatigue levels. Dog stress and fatigue? You might be thinking, "What's so hard about being petted and hugged by hundreds of people each day?" Well, it's not that simple. These dogs know they're working. 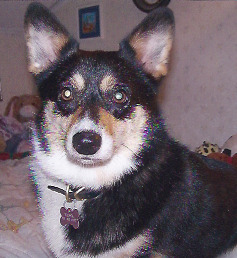 They don't sniff the ground or eliminate without permission and must maintain impeccable obedience hour after hour. They must go up and down endless flights of stairs without pulling their handlers and ride in crowded elevators with strange dogs without becoming quarrelsome. And as far as being petted by so many people, how would you react to being rushed by groups of 20, 30 or more strangers squealing with delight, slamming locker doors and coming from all directions without warning? In describing the impact of the TDI teams at the schools in Newtown, Conn., Jay Smith, principal of Reed Intermediate, had this to say to Ursula Kempe: "Speaking specifically about Reed Intermediate, we have had dog teams embedded here all day/every school day since the tragedy (not to mention the many other teams that have staffed our town-wide Counseling Center, also held at Reed, every night, weekend and holiday)." He goes on to say, "The sensitivity and tact of the handlers and the gentleness and love exuded by the dogs has made an incalculable positive contribution to helping our children and adults regain their equilibrium. I've lost count of the number of parents who have told me, 'When asked about their school day, all my child wants to talk about are the dogs.'" 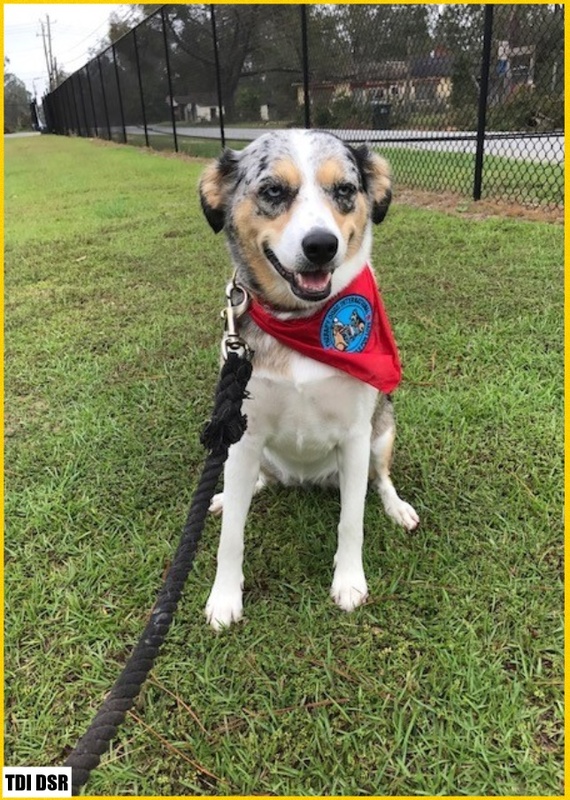 Various mental health professionals who are with us daily generously said that the four-legged therapists are having the more profound impact! A more simple, if somewhat less-eloquent, description of the effect the dogs have made was offered by a young girl at Taft Union High who threw her arms around Frank's neck, looked up at me with a big smile and said, "This is my best day ever!" 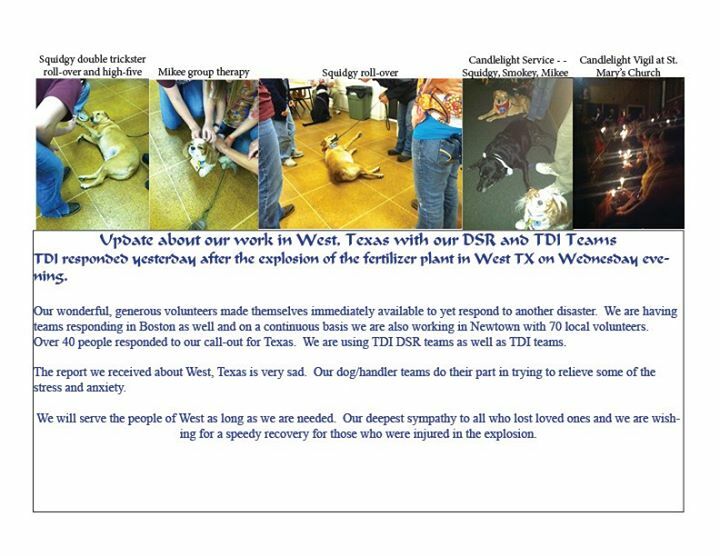 Shown in our video are TDI's Disaster Stress Relief Dog teams and TDI dog teams who responded after the Oklahoma Tornado from May 20th, 2013.